Realidades chapter 3B in Cornell Notes format. These Cornell Notes cover adjective agreement, and the irregular verb "ser" in the present tense. 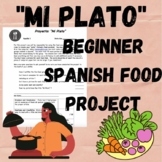 Vocabulary about health, dinner, and dessert are also included. To help my students get MORE out of reading el camerero horrible, Realidades 3b TPR story, I created questions to go along with the story. There are questions for pre-viewing, each paragraph and questions to answer after. There's also space for students to write a new ending to the story. 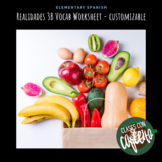 Great review worksheet featuring a variety of practice activities based on the Realidades 3B vocabulary. Completely customizable Word document.